To hear James’s story read by Margaret Allan, (James’s Great Niece); please press play on the audio file. 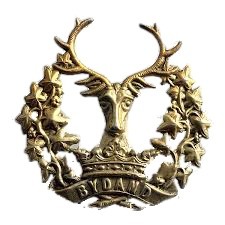 Lance Corporal James Elvidge Young 7644, 1st Battalion Gordon Highlanders. James Elvidge Young was born on the 30th April 1884 in London. He was the youngest son of James and Euphemia Young. The family eventually moved to Scone. His father was a Butcher and they owned the Butcher shop and house in Perth Road. James emigrated to Canada and met his wife, Christina, there. On their return, he settled in Glasgow with his wife and their two children. At the outbreak of War, James enlisted into the Gordon Highlanders. He had a couple of run-ins with the military authorities and could be described as “a bit of a lad”, but he showed himself worthy of leading men. He was soon active in France and involved in a number of offensives. Lance Corporal James Elvidge Young was killed in action on 30th April 1916, the day of his 32nd birthday, at St Elio. He is buried in Kemmel Chateau Militery Cemetery, Belgium. He was awarded the Star, Victory and British War medals. Pleased to see Jame Elvidge Young mentioned here. He was my grandfather’s cousin.